I recently got my retrode 2.0 in the mail, and attempted to follow the firmware update instructions. The first time I selected the usb subfolder using FLIP it installed a usb driver, changing the name of the device to AT90USB64. I then went to FLIP and selected AT90USB646 and tried to open the USB driver. It kept telling me cannot open, so i attempted to eject the device and replug it back in. Once i did that it has gone back to an Unknown device and if I try to update the drivers it states my device already has the best drivers for it. In properties under device status it says "Windows has stopped this device because it has reported problems. 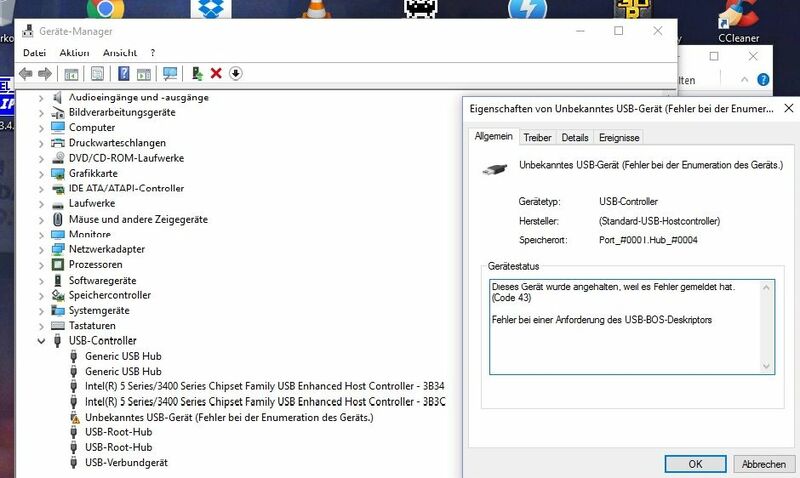 (Code 43)" Doing searches on the internet for that error I have tried uninstalling drivers, rescanning for the device, turning off my computer for a few minutes, and trying different USB ports but still get the same error. Appreciate any help if anyone knows what to do. Thanks! In which mode (DFU mode entered using HWB and Reset buttons, or normal mode) of the Retrode do the errors appear? What does a different computer say? I'm using Windows 7 64 bit, and the second I plug it back in it shows that error. It still appears in the device list but it has a little ! in a yellow triangle. If i try putting it in DFU mode it doesnt seem to change anything on windows. 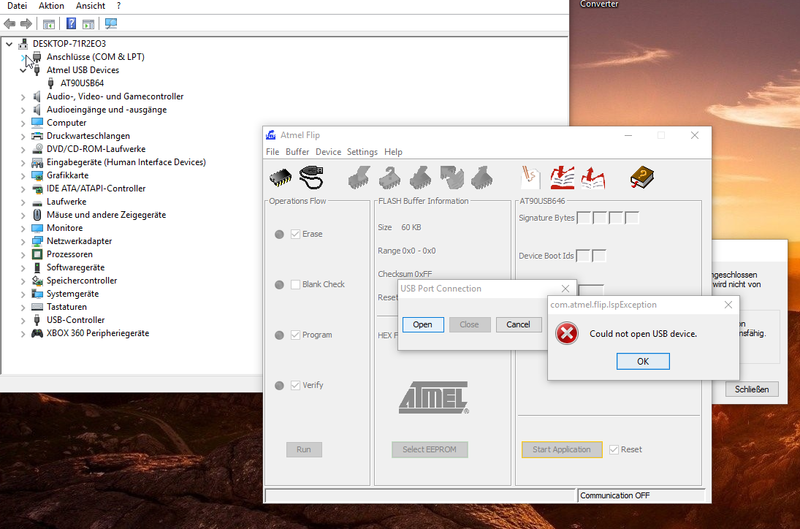 I tried on a different computer and right when I plugged it in same thing, unknown device with the yellow error triangle and error code 43. The more detailed info you provide, the easier it will be to understand and fix your problem. Weird, never seen anything like this. So everything was normal until you tried to update the firmware? Everything seemed normal yes. I plugged in the device, it popped up as unknown device (without the error). I switched its mode, then told the driver to update from the USB subfolder in FLIP. The device name on device manager switched to say AT90USB64. I opened up flip, selected the AT90USB646, and then tried to open the usb port. When i did this it says can not open usb, tried a couple more times, still wouldnt open. Tried to eject the device, and plug it back in, came up with unknown device once more with the error, and hasn't let me do anything since. I had issues with my retrode at work not detecting either way correctly. I solved that issue by reloading the USB 2.0 drivers for Windows. That might help you in this instance. Not entirely sure. What was weird all my other USB devices worked fine except my retrode. Then I reloaded the drivers now everything works. Any news on this problem? Please let us know if you found a solution; otherwise, please contact me personally to arrange replacement/return. Well, in this case, I know what the error is. We are updating the Retrodes to the latest firmware version before we ship it. Unfortunately, I didn't realize that until some customers reported that, so there are at least 10 units that had been shipped out without a firmware. We got some back and fixed them with reflashing, some customers did it themselves and that also fixed the units. So to fix them, you can either send it back (we'll cover the shipping) or try to flash it yourself. 1. Install FLIP software. Inside the directory where it was installed, you can find the USB drivers. 2. Press BOTH buttons on the Retrode, plug it into the PC. Then let go of the back button, then of the front button. Tell Windows to use the FLIP drivers for the USB connection. 3. Run the FLIP software, load the firmware (you can get that from the homepage as well, I suggest to use the latest one), open the USB connection and Flash the firmware. When it's done, unplug and replug it and it should work fine. I'm sorry for the issues! Have you uninstalled and re-installed the Jungo driver just in case something went wrong the first time? (device manager - uninstall device; delete driver). I've done a quick web search, and some people seem to successfully fix this kind of error by updating the USB hub driver too. yup, i completely removed the jungo driver, but it didnt help. After i completely remove the driver, and try to make the Retrode ready to Flash again (via HW+RESET Button) it only gets recognized as unknown hardware. 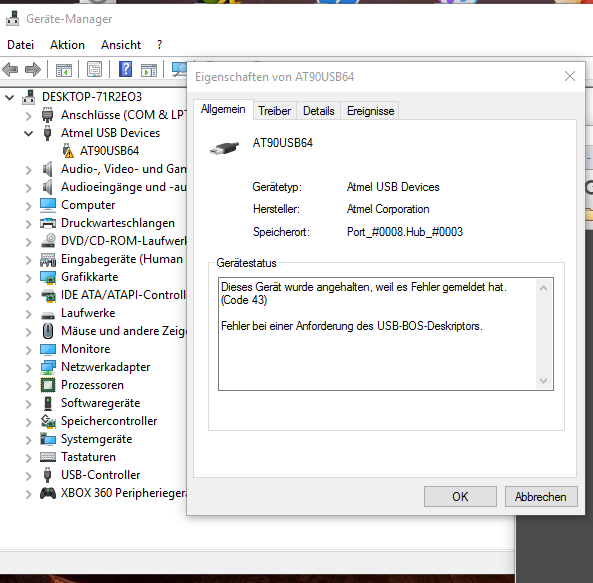 Installing the jungo AT90... driver on it works, but stil results in the FLIP error message shown above (could not open USB device). EDIT: Just tried it on another pc (laptop with Win10) and it isnt working either. i even cant install the Jungo drivers as it has problems recognizing the device at all after using HW+Reset Button. Seems like a Win 10 problem then.